After nearly 10 years at war with no end in sight, last night Americans received word from President Obama that the military achieved another milestone in the ongoing "War on Terror." News of Osama Bin Laden's assassination was met with mixed reactions across the country. Some expressed uneasiness at the sight of celebration in Washington DC and New York City, and others found catharsis in the demise of Al Qaeda's longtime leader. While we individually and collectively continue to process our feelings on the matter, corporations have wasted no time attempting to exploit the moment for the sake of a quick sale. 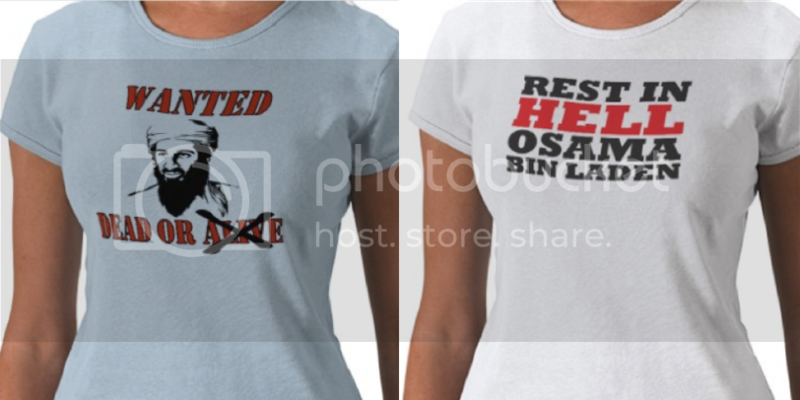 Pastry Clothing, fronted by young moguls Vanessa and Angela Simmons, added t-shirts that read "Rest in Hell Osama Bin Laden" and "Obama Killed Osama" within hours of the President's announcement. What better way to commemorate a historical epoch than with gross materialism? The Simmons sisters seem like nice women, but this is a tasteless move. A move orchestrated so quickly, in fact, that I doubt they were even consulted before the shirts were thrown up on the site. I hope they'll reconsider Pastry's decision to cash in on the raw emotion that accompanied the death of a man responsible for the loss of thousands across the globe. UPDATE: The shirts have been removed from the Pastry website. Are the t-shirts in poor taste or is this a good business move? Share your thoughts!